Chuck Thornton, Pastor at Large at the Peninsula Grace Brethren Church in Soldotna, Alaska (Keith Randall, pastor), sends along this delightful article and photos of the Soldotna church’s recent event. Cars, pickups, and even a motorcycle began arriving at the site. The Tesoro Oil Company’s Picnic Grounds was the place. Some 125 people from Peninsula Grace Brethren Church, Soldotna, Alaska attended the all-church picnic on Sunday, July 15th. By 4:30 pm canoes were launched on the lake. By 5:00 kayaks had been added to the flotilla. “Y’all come” was the invitation (some of our people hail from the south). So we did. Some regretted wearing sweatshirts, because the sun was shining and the day was… well, the day was considerably warmer than at first expected. Some hardy souls (plus a bunch of children) went swimming in the (approximately) 63 degree lake. Frisbees and footballs flew. The volleyball court was busy. People talked (some simply sat, sunned, and, maybe, snored). Chef Leroy and his minions ably grilled the hamburgers and hotdogs, while the ladies set out the side-dishes and desserts (among which was one of Janice Thornton’s strawberry-rhubarb pies – Umm-mm!). Lemonade was the beverage of (only) choice. At 5:00 pm, the “Unity Drummers” played and sang Native Alaskan songs. Then we ate. But that was just the beginning. There was more to come. After the eating, the Drummers led us in another Native song: “Jesus, Purify us”. So Tim told Carlos the Old, Old Story, and shortly after the main foot washing had ended I looked into the pavilion, and there was Tim, kneeling at the feet of his “new-born brother-in Christ” nephew, washing his feet. What a Birthday celebration there must have been in heaven just then! Following that we shared in the Eucharist. Then, after the Drummers led us in “We Are One in the Spirit, We Are One in the Lord”, we moved to the lake front. 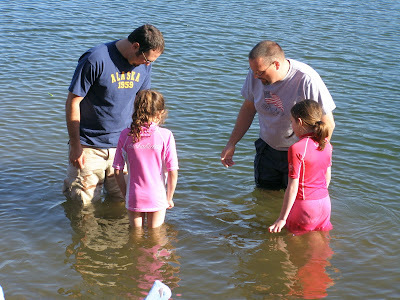 There Pastor Keith presided as Brian baptized his two daughters, Fiona and Devon, in testimony to their faith. Then back home again. Back to…a normal week? No way! We entered the week with a renewed sense of what it means to be part of the Church of Jesus Christ, including being a portion of the clan called Grace Brethren, as well as the Peninsula Grace family. Picnic – Alaskan style…now that’s the way to do it (up here on the Kenai Peninsula, at least). 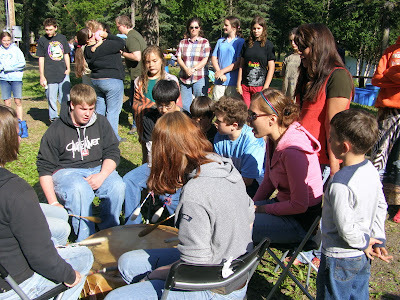 At 5:00 pm, the “Unity Drummers” played and sang Native Alaskan songs.